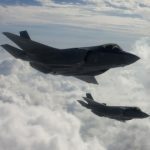 Lockheed Martin (NYSE: LMT) has been awarded a potential $5.4 billion contract modification to provide a total of 55 F-35 low-rate initial production fighter planes to multiple domestic and international defense customers. The award modifies a previously received LRIP Lot 9 advance acquisition contract, and about $625 million in fiscal 2016 U.S. military aircraft procurement funds and foreign military sales funds are being obligated at the time of award, the Defense Department said Tuesday. Lockheed will build F-35As for the U.S. Air Force and the governments of Norway, Israel and Japan. The U.S. Marine Corps and the British navy ordered F-35Bs, while the U.S. Navy bought F-35Cs. The Naval Air Systems Command in Maryland is the contracting activity. Lockheed will perform work at various sites in Texas, California, Florida, Maryland and New Hampshire, as well as at international facilities in the U.K and Japan, through December 2017.